Albert Camus was wrong. Sisyphus was not the happiest of men. Condemned by Zeus to roll a huge boulder up a hill only to watch it roll back down time and time again, he would only be happy were he to give himself over completely to the task of rolling his bounder up the hill—and if he had no awareness of any existence apart from it. 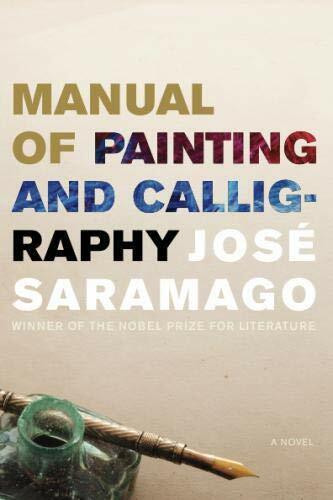 This is the existential dilemma the lead character faces in José Saramago’s marvelous exploration of the artist’s mind, Manual of Painting and Calligraphy. What happens when Sisyphus realizes that he has betrayed his purpose by allowing himself to become slavishly attached to his labor? This is not a light summer read. It is dense, at times rambling, and a bit of a challenge. The reader has to engage with the novelist and pay attention or get lost. There is a reason the first edition of this novel won the Nobel Prize for literature in 1998. The first-person narrator, known only as H, is a painter of portraits and quite an accomplished one. He gets commissions from the wealthy and acquits himself well. His work product is accepted and fawned over by people who know absolutely nothing about art, don’t care to know, and about whom the artist cares even less. In short, he feels he has sold out. He considers himself a portraitist, not a serious painter, and yet his agony is that he knows himself capable of much more. What that “more” is, or what direction he would have to take to get him to it, he has not a clue. In many ways, H’s life is about as hapless and artless as his work. He has a lover he is indifferent to—and who is indifferent to him. His small circle of familiar but not intimate friends is merely part of his routine. His life, in short, is one loooooong yawn of ennui. Feeling himself at a turning point at which he feels the urge to destroy everything and start over, he turns to writing a novel hoping to jar something loose in him so he can use the unfamiliar medium to reconnect with his artist’s soul. Knowing nothing about the art of the novel, he jumps from journaling about his present life to the construction of his autobiography. As in all such explorations, there are many false starts, meanderings, and musings. The triumph of José Saramago’s narrative is that he can create order out of such chaos. He makes peace between the polarities of self loathing disgust, and hope for salvation of sorts, in a work that is rich in the details of the artist’s outer and inner life, such as his habit of taking his watch off when he starts to paint (entering a timeless space?) or his observation of the sounds different people make on the stairway from his apartment studio when they are leaving him. He also addresses philosophical questions on the nature of and rationale for art, and the paradoxical nature of the artist himself who creates truth from fabrication, the agreed upon lie. H’s journey begins, as most journeys must, with trauma, the catharsis of disgust he feels about himself and the subjects of his portraits. During the process of painting a man he identifies only as S, he paints two portraits. One is the public one, the effortless one, the one that will be approved and paid for, the one that has no soul. The other portrait he paints in the back room of his studio. It is this second portrait that captures the artist’s more genuine perception of the subject, a mirror into the soul of the man. It is with this shadow painting that he lights the spark of rediscovery. Manual of Painting and Calligraphy is a personal as well as an artistic journey because H’s life is a gestalt. If he mends his artistic soul, he begins to mend everything else in his life. The emptiness and futility of Sisyphus’ pointless labor affects his whole world. This first translation from the Portuguese by Giovanni Pontero Carcanet, never seems like a translation. There is none of the labored prose one often associates with such efforts. It is fresh, spontaneous and evocative, well worth the effort it takes to join in H’s quest.